LMU is now a member of the Europaeum, an association of 11 leading European universities founded with the intention of promoting excellence in research and teaching, specifically in the field of European Studies. The Europaeum is an academic network that focuses on the Humanities and Social and Economic Sciences. 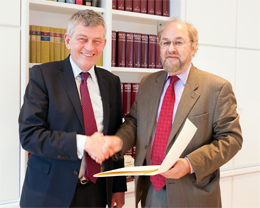 With the signing of the declaration of accession this week by LMU’s President Professor Bernd Huber and Dr. Paul Flather, Secretary-General of the Europaeum and Fellow of Mansfield College at Oxford University, LMU is currently the only German university in the network. Founded in 1992, the Europaeum also counts Oxford University, the Université Paris – Panthéon-Sorbonne, the Universidad Complutense de Madrid and Charles University in Prague among its members. LMU’s President Professor Bernd Huber and Dr. Paul Flather, Secretary-General of the Europaeum, sign LMU's declaration of accession to the network. “Our admission to the Europaeum brings a further extension of our international network, and will expand the range of our academic exchanges in the Humanities and Social Sciences with our distinguished partners in the consortium, such as Oxford University,” says LMU President Bernd Huber. “We are delighted to welcome such a distinguished new partner as LMU to our Europaeum association,” says Dr Paul Flather, the association’s Secretary-General. “We have already opened up some of our programmes to LMU graduates, and hope this week to start work on new initiatives for international collaboration in the Humanities and Social Sciences." The Europaeum’s activities include organizing collaborative courses, summer schools and Master’s programmes, arranging interdisciplinary conferences and workshops, facilitating research visits, and opening fellowship schemes and mobility programmes to applicants from the partner universities. Among other things, this means that LMU students are now eligible to apply for one of the Jenkins Scholarships, which qualifies them to participate in one of the Master’s Programmes in the Humanities and Social Sciences at Oxford University. The Europaeum’s major research focus is on the field of European Studies, and its primary goal is the education of a pool of talents – a group of gifted scholars who will carry out collaborative investigations of specifically European topics. In addition, the Europaeum seeks to promote cooperation between its member institutions, to stimulate dialog between academic researchers and the spheres of politics, commerce, the media and culture, and to train future European political and business leaders.